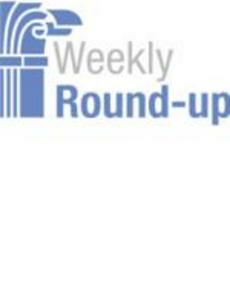 The IBM Center's Weekly Round Up highlights articles and insights that we found interesting for the week ending May 15. OMB Deputy Director Beth Cobert discusses importance of #SES #leadership to government performance @ombpress. http://www.govexec.com/management/2015/05/obama-management-chief-senior-... Cybersecurity matters for achievement of agency missions, says @usNISTgov expert Ron Ross.http://www.federalnewsradio.com/241/3857152/Cybersecurity-mission-areas-... More #procurement #transparency from @usGSA -- supports broader category management initiative. http://www.federaltimes.com/story/government/acquisition/gsa-gwac/2015/0... John Kamensky DATA Act Implementation Meets Milestone. Congress set a 3-year deadline on implementing the far-reaching requirements of the Digital Accountability and Transparency Act. The first deadline – to develop a set of common reporting standards by early May 2015 for all spending above $3,000 – was met. Federal News Radio reports that additional deadlines loom, but seem attainable. Chief Learning Officers Step Into Limelight. Federal News Radio highlights the important role of agency CLOs, based on a survey it conducted of CLOs and Chief Human Capital Officers, noting that they aren’t “glorified guidance counselors” but are strategic partners in training the workforce. Getting Off GAO’s High Risk List. Government Executive reports on a recent forum held at the National Academy of Public Administration on agencies on the GAO High Risk List. Since GAO began the list in the early 1990s, agencies have had difficulty getting off the list, which is seen “as a risk-management diagnostic tool and conversation starter for agency funding.” Social Security’s 10-Year Plan. Government Executive reports that even though the Social Security Administration has been without a confirmed head for more than two years, it has not deterred the agency from thinking ahead. It released a 10-year service delivery plan that helps frame its vision, investment needs, and staffing needs at a time when the Baby Boomers will be retiring in mass. Michael J. Keegan Interoperability Provisions Added to 21st Century Cures Draft Bill. House Energy and Commerce Committee leaders have unveiled a revised draft of the 21st Century Cures Act that includes language to bolster interoperability. Stakeholders largely support the draft measure's interoperability provisions but are concerned about the lack of telehealth provisions. Modern Healthcare Few Patient-Centered Medical Homes Using IT for Care Coordination.A new study finds that most doctors at patient-centered medical homes are not leveraging health IT to bolster care coordination, which is a top priority for them. When asked about the largest barriers to using electronic care coordination methods, respondents cited issues using IT or electronic health records, as well as money and time. FierceEMR, Annals of Family Medicine Fitness and Health Market Opportunities for Wearables.The connected health market offers plenty of growth opportunities.There will be significant interest from consumer health and fitness device makers to work with traditional health and medical devices on technology collaboration and data integration. Official: VA wastes $5 billion a year in improper purchases.The Veterans Affairs Department is improperly spending at least $5 billion a year for medical care and supplies being purchased in violation of required practices. Slow progress forces Navy to change strategies for cloud, data centers.The Department of Navy later this summer will move the Data Center and Application Optimization program office under its PEO-EIS group and out of its SPAWAR organization. Tony Summerlin and Niall Brennan discuss big data.When it comes to big data, “[There are] way too many buzzwords, way too many white elephants, way too much trust placed in magical, out-of-the-box solutions,” said Brennan. “Big data holds incredible promise but it needs to be linked to the fundamentals.” Those fundamentals include subject matter experts who can cast an educated eye on the data while providing a problem-solving approach and a focus on tangible outcomes rather than meaningless process, Brennan said. The Business of Government Radio Show - Kathy Martinez, Assistant Secretary of Labor for Disability Employment Policy. What are the strategic priorities for the U.S. Dept. of Labor’s Office of Disability Employment Policy? What are the persistent barriers to employment for people with disabilities? How is technology creating new opportunities for people with disabilities? Join host Michael Keegan as he explores these questions with Kathy Martinez, Assistant Secretary of Labor for Disability Employment Policy. Broadcast Schedule: The show airs Monday at 11 a.m., and Wednesday at noon, on Federal News Radio 1500AM WFED. If you can't wait, though, you can listen to (or download) this week's program and all our previous interviews at businessofgovernment.org.